Umberto D is one of the enduring masterpieces of Italian neorealism, considered by many to be one of the greatest films ever made. Everything that neorealism represents can be found in this simple, heartbreaking story of an aged Roman named Umberto (played by Carlo Battisti, non-professional actor and retired college professor) who struggles to survive in a city plagued by passive disregard for the post-World War II plight of the elderly. With his little dog, Flike, as his only companion, Umberto faces imminent eviction, and his insufficient pension and failed attempts to raise money lead him to contemplate suicide... if he can find a home for Flike. His dilemma — and director Vittorio De Sica's compassionate, unsentimental handling of it — results in a film of uncompromising grace and authenticity. 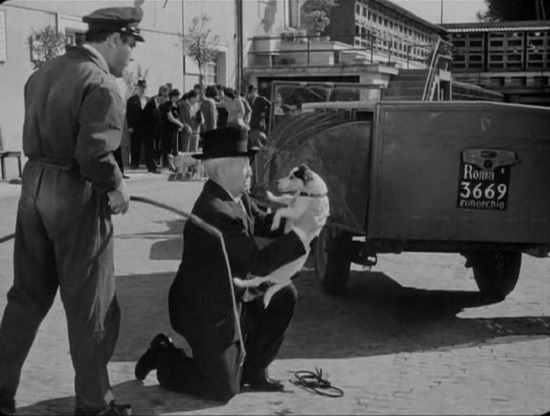 Like De Sica's earlier masterpieces Shoeshine and The Bicycle Thief, Umberto D earns its teardrops honestly; if this timeless classic doesn't make you smile and cry; you'd better check for a pulse. 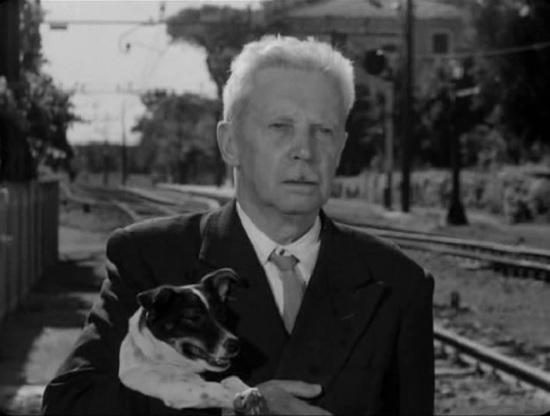 Umberto D may be said to complete De Sica’s neorealist trilogy of solitude. It was De Sica’s favorite work, produced with his own money, and its disastrous record at the box office was due in some measure to the fact that few sentimental concessions to public taste were allowed. Yet, André Bazin’s view that the work was a masterpiece in the face of bitter critical opposition when it first appeared in Paris has now been generally accepted. 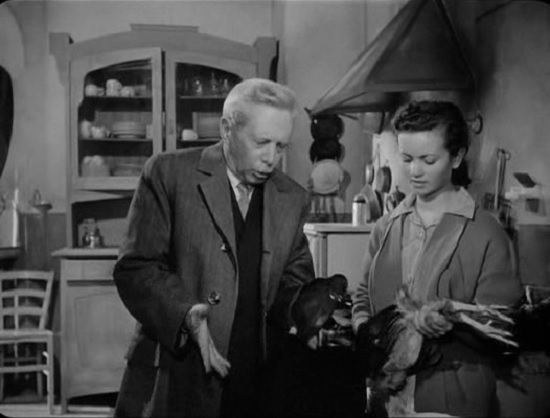 De Sica’s choice and direction of nonprofessional actors is brilliant: Umberto D was portrayed by a professor from Florence whose facial expressions and general appearance capture perfectly the mannerisms and the moral values of the older generation. While the film deals courageously with the problem of the aged in modern society, it steadfastly refuses an overly sentimentalized perspective. 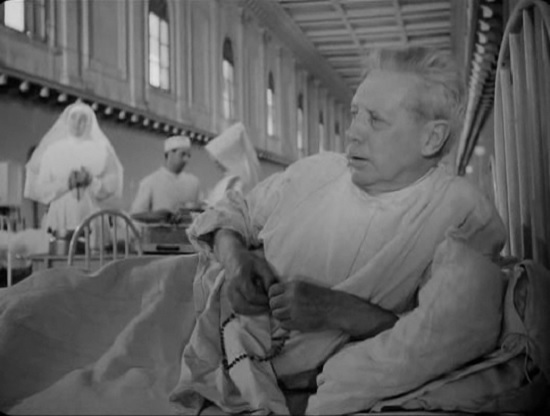 Umberto D is purposely characterized as cross, irritable, and grouchy, for De Sica wanted him to have an untidy, unpleasant disposition, since the aged are considered a nuisance to others and sometimes even to themselves. Umberto’s position in Italian society is even more tragic than the plight of the characters in De Sica’s earlier films: he lacks the protection Ricci enjoyed from his family, and most of his few friends are now dead; there remains only his mongrel dog and Maria, a pitiful young maid whose life is even more desperate than his, for she is an unwed mother who will lose her job as soon as the bigoted landlady notices her condition. Because Umberto is part of the middle class, his life often revolves around the protection of outward appearance — a clean shirt, proper behavior, good manners — what the Italians call a bella figura in public. As inflation and illness erode his meager pension, he is almost more afraid of losing face, of appearing poor, than of poverty itself. 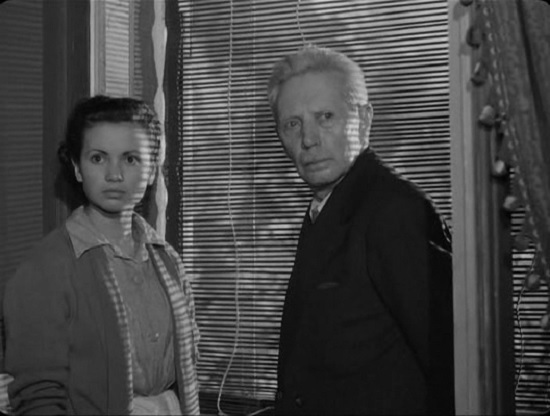 Once again, De Sica poses a dilemma similar to that in The Bicycle Thief: will Umberto’s problems be resolved with a mere increment to his pension, or is social reform incapable of curing human solitude? 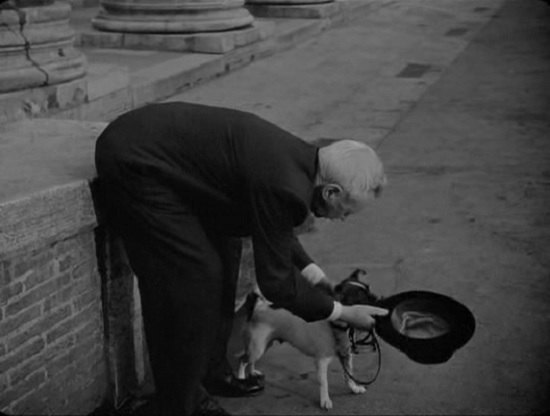 The story line of Umberto D. could be the story of any man in any western country caught up in old age by changes he couldn't understand without sufficient resources to survive. Urbanization had loosened family and other ties in Italy and indeed all over Europe, and many men in the post-war period found themselves alone in the city without anyone to turn to in times of personal crisis. The movie opens with a group of pensioners marching through the streets of Rome demanding an increase in their pensions. The march is broken up gently by the police and the marchers are ordered to disperse as they had no permit. Umberto is one of these men and the film chronicles this one man's struggle with the reality of his redundancy. He eats in a soup kitchen (and gives half of his food to his dog) and his daily life revolves around trying to scrounge up enough money to pay his monthly rent by selling off his better possessions. He occasionally crosses paths with old "friends" from better days, but when they learn of his plight, they turn their backs on him. He can't bring himself to beg. When on the brink of success at his first begging attempt, pride causes him to turn his palm upside down and refuse what is offered. His most beloved possession is his dog Flike and the only other person he sympathizes is Maria, a maid who befriends him. None of his half-baked attempts to come up with his rent arrears succeed including his feigning illness in order to be admitted to a charity hospital, thereby saving the meager soup-kitchen fee for a few days. When he returns to the apartment, he finds workmen renovating the entire place. The landlady is getting married. Umberto's room has a gaping hole in the wall; the maid tells him it is to become part of an enlarged living room. The maid was taking care of the dog, but a door was left open and Flike had run away when he was in hospital. Umberto rushes to the city pound and is relieved to find his dog. Reunited with his dog and facing eviction, he felt the only way out was suicide. He even fails at that and momentarily loses the trust of his beloved Flike. The film is remarkable for the aesthetic effects achieved through extensive use of deep-focus photography both within studio interiors and outside on location. The film depicts the stark aspects of poverty. Black and white film really accentuates the film-maker's portrayal of the drabness of everyday life in post-war Rome. Umberto’s insignificance in Italian society is underlined right from De Sica’s first scene, an extremely high-angle shot down on a crowd of demonstrating pensioners. The position of the camera accentuates their insignificance and vulnerability; as police can sweep them effortlessly off the street because they lack a parade permit, we are reminded of insects being brushed aside, a visual hint that is later reinforced when the maid scatters a swarm of ants in her kitchen. Older people are as expendable as insects in this society. In four locations crucial to the film’s meaning, the depth of field in the photography goes beyond simple representation of any “real” spatial distribution of objects to produce a visual correlative of the loneliness and solitude felt by Umberto. The long, empty hall of his apartment projects a sterile, hostile, foreboding environment. The many rows of hungry men eating in the charity soup kitchen he frequents, similar to the endless rows of pawned linens in The Bicycle Thief, inform us that Umberto is no isolated case but only one tragic character out of thousands. The long halls of the hospital with their endless lines of elderly patients suggest the desperation people in De Sica’s universe must feel. 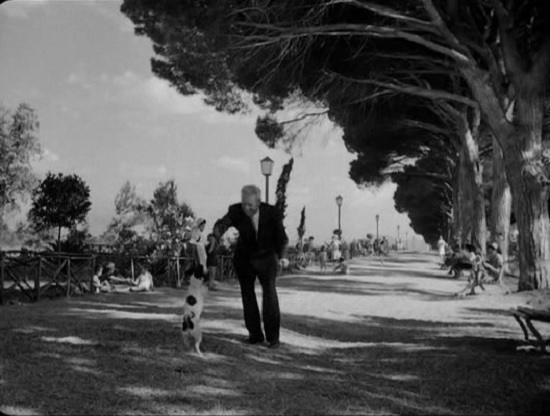 Finally, the endless rows of trees interspersed with playing children that close the film after Umberto’s unsuccessful suicide attempt allow the main characters — the old man and his dog — gradually to merge into the background and out of our vision in a lyrical ending reminiscent of the disappearance of Ricci and Bruno into the soccer crowd. 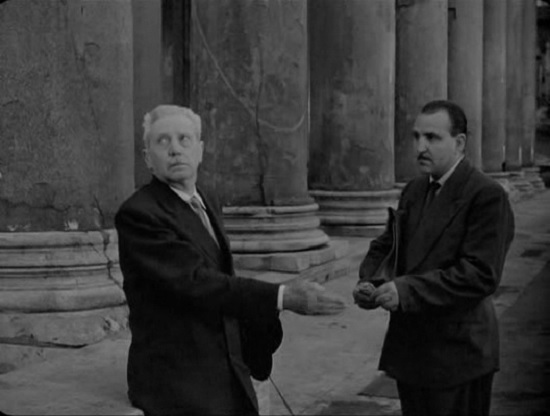 De Sica’s reliance upon the sound track to advance the story of Umberto D, represents a step beyond The Bicycle Thief. His landlady, once kept alive by her old boarder’s surplus ration coupons during the war, now wants to evict him, and she even rents his room by the hour to prostitutes and adulterers; yet she is so hypocritical she will doubtless fire Maria when she learns of her pregnancy. The decor of the apartment, her lover, and her friends all show her selfishness, superficiality, and her venality, and the immoral qualities she exhibits are underscored by the sound track, which almost always associates her with opera heard on a record. She views operatic music not as an expression of genuine emotions, which she could appreciate neither in art nor in life, but as a means of confirming her social status. Opera, with its refined control of emotion and its theatrical or melodramatic overtones, is posed by De Sica as a counterpoint to the genuine, elemental, and truly pathetic human suffering experienced by both the maid and Umberto but ignored by the landlady. 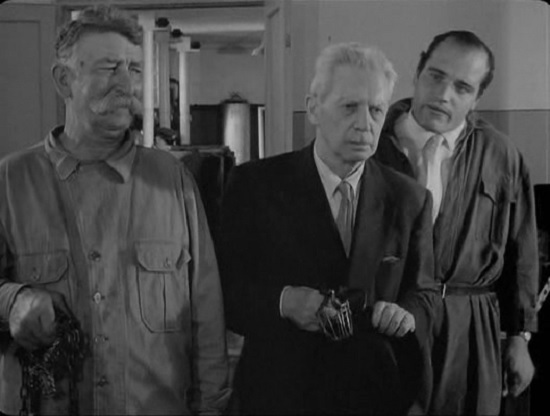 As in his earlier works, which employed parallel subplots, De Sica again delineates character by playing Umberto’s tragedy off against that of Maria, the maid. Throughout the film, she is his counterpart in suffering, but Umberto rarely understands how similar their lives actually are, just as no one understands his suffering. 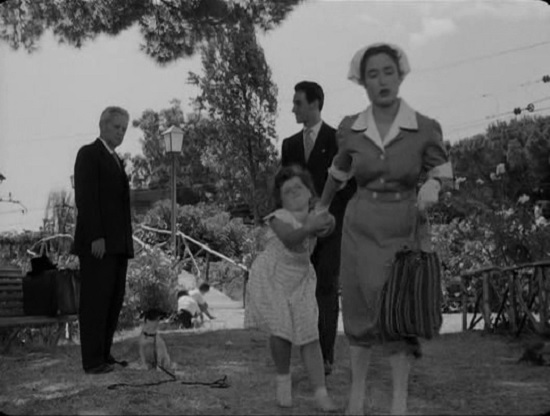 When Maria’s negligence allows the dog to escape, Umberto scolds her for her carelessness immediately after she has told her boyfriend about her pregnancy and has been abandoned by him. Umberto is concerned for his dog and is completely unconscious of her pain, yet he expects others to be sensitive to his problems. Human loneliness thus fails to produce a sense of empathy in us, and as the film ends, Umberto is left alone with his pet — his problems and especially his solitude still unresolved. Bazin has cleverly remarked that “the cinema has rarely gone such a long way toward making us aware of what it is to be a man. (And also, for that matter, of what it is to be a dog.)”. De Sica has also shown us in no uncertain terms that there is very little difference between the two. 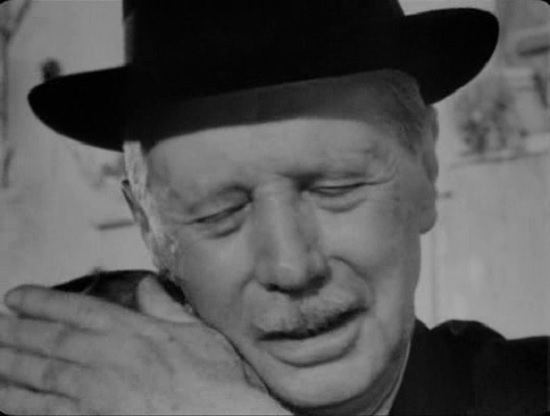 No wonder Umberto D was a favorite of the great director Ingmar Bergman too. It is a genuine masterpiece: compassionately and truthfully written, humanely and brilliantly directed and blessed with a remarkable cast.